Call it a household name. A new analysis from Zillow finds a home owned by a person named Alison or Stuart is likely to be worth roughly two-thirds more than the typical home in the U.S.—for both of them, that equates to over $332,000. The link varies based on location, with some names suited more to one region than others given sociocultural influences. Ali and Stu are joined by the likes of Anne, Geoffrey, Marina and Peter, to (ahem) name a few, but conventionally female names overtake conventionally male names by a wide margin. The names tied to the most valuable homes also have homes with more living space, generally upwards of 1,550 square feet. At first glance, the names boasting the most valuable homes in each state are common: Janes, Jills and Julies, plus a Martha for good measure. 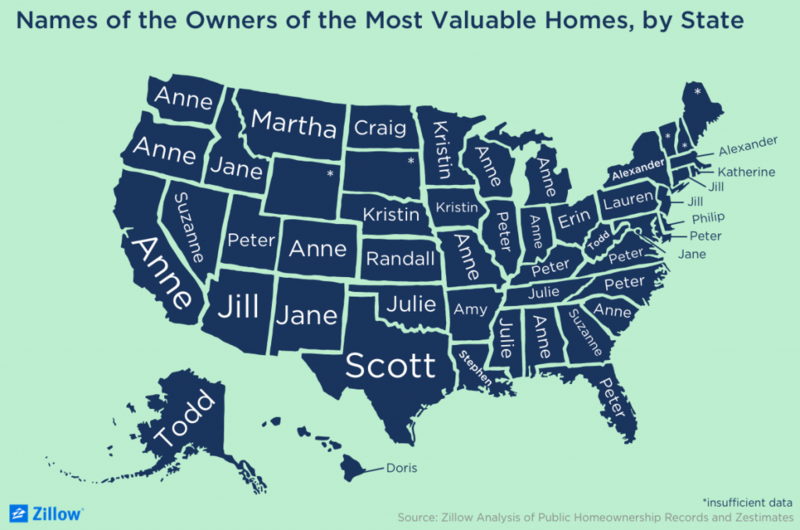 Look again, though—homeowners named Suzanne tend to have the most valuable homes in not one, but two states. Suzanne! Nevermind that home values in Georgia are relatively lower than those in other housing markets. Nevermind that Nevada was ground zero for the collapse. Two states. Two states! Note: Zillow's got everyone covered with a neat tool matching virtually every name ever given with homeownership-related data. Select yours to see the stats!